This hip fundraiser is your chance to call the St. Louis Arc’s bluff and make a real difference in the lives of people with developmental disabilities. 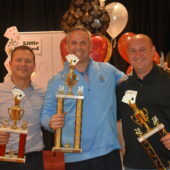 The Showdown for St. Louis Arc Texas Hold ‘Em event includes prizes for table champions, food and beverages and a silent auction. Whether you play at home, online or at the casinos, you may have what it takes to be a winner – and you’ll be helping the people and families of the St. Louis Arc. Congratulations to Chris Koon, champion of the “Showdown for the St. Louis Arc” Texas Hold ‘Em Poker Tournament for 2018. Nick Pate placed 2nd place and Pete Sebelski placed 3rd. For more information, to sponsor, or make a silent auction donation for the next “Showdown for St. Louis Arc” event, contact Tessa Klassen, Special Events Manager, at 314-817-2241.